The so called Angelfishes are cichlids belonging to the genus Pterophyllum in the family Cichlidae. They are often referred to simply as “Angels”. Wild Ptherophyllum cichlids live in slowly moving water in the Amazon and Guyana River in South America, and in smaller rivers and streams connected to these rivers. These waters are often filled with algae and compactly grown plants, and the Angelfish has developed a body ideal for venturing through such environments without getting entangled. The body of an Angelfish is flat and rounded like a disc, and laterally compressed. When the Angelfish swims, it keeps its body upright. The dorsal, pectoral and ventral fins are long and the tail of the fish is broadly splayed. You can see dark vertical bands alternated with lighter areas on the body and fins of an Angelfish. This colouration enhances the tall look of the Angelfish. Zeus scalaris was the first Angelfish described by science. A man named Liechtenstein collected the fish in Brazil in 1823, and it was later sent to the Berlin Museum. In 1840, Heckel found one other Angelfish and named it Pterophyllum scalaris. Ptherophyllum means “having fins like leaves”. Today, the Angelfish is named Ptherophyllum scalare, but this name wasn’t coined until the beginning of the 1900s. The dorsal fins of the Angelfish look a bit like a stairway, hence the name scalare. 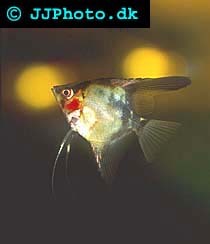 Later research has shown that the domestic variants of Angelfish kept in aquariums today might actually originate from several species, not only from the wild Pterophyllum scalare. Angelfish have been bred in captivity for a long time, and most breeders did not keep any records regarding the ancestry of the fish they produced. Many breeders were even incapable of distinguishing different similar species from each other. Some ichthyologists have actually suggested that we might still have a problem with this, and that what is commonly believed to be one species, the Pterophyllum scalare, contains several species. Pterophyllum scalare caught in the wild will often display significant external variations, including having differently sized scales. Some individuals even have predorsal fins that do not fit the official species description for Pterophyllum scalare. Our commonly known Angelfish might therefore be the result of interbreeding between many similar species in aquariums during numerous years. Naturally, our domestic Angelfish is also a result of random mutations that have occurred during years of breeding. Some mutations have been well liked and encouraged, while others have been bred out from the line. Significant mutations are rare, and during the last 50 years of Angelfish breeding perpetuated mutations have probably occurred no more than 25-35 times. Minor mutations can however also gradually change species characteristics by accumulating over numerous generations.